WB result of USP18 antibody(12153-1-AP) with MCF-7 cells (Control and CRISPR USP18). USP18(UBP43) is a 43 kDa protein that is known as an ISG15-deconjugating enzyme and an inhibitor of type I IFN signaling independent of its enzyme activity. USP18 can efficiently cleave only ISG15 fusions including native ISG15 conjugates linked via isopeptide bonds. It can be detected two bands(apparent MW of 38 and 35 kDa), the faster migrating one results from proteolytic processing in human primary hepatocytes(PMID:21779393). 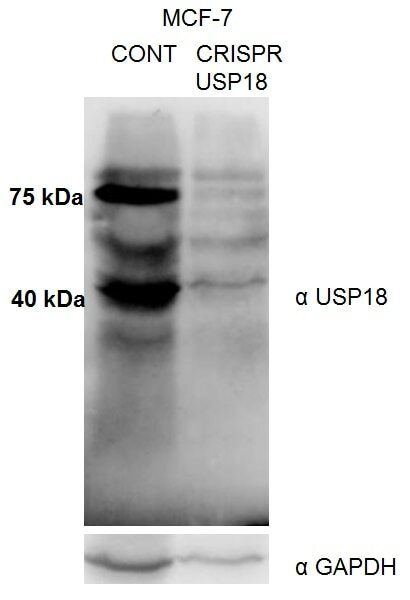 Sometimes the 70 kDa band is showed on the SDS-PAGE that it is considered as the complex of ISG15 and USP18(PMID: 14673145).